The Prime KS-10 kart suit was specifically designed to be fully personalised using prints while at the same time offering the driver light weight, comfort and breathability. COMPOSITION: Polyester/Polyamide. Two-layer sandwich with overall weight of about 440/460 g/m². 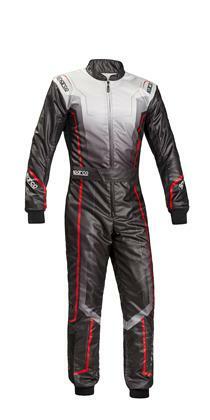 CHARACTERISTICS: The Prime KS-10 suit has two layers with elasticised panels at the armpits and back. Perforated panels at the back, armpits, inner leg and outer thigh allow the suit to breathe and thus minimise the condensation of sweat and improve comfort. Ribbed neck and concealed zip. Pockets and classic belt. The suit can be fully personalised with prints. Cordura back protection which increases resistance to wear and tear at the points in most contact with the kart seat.